They're tiny and seemingly meaningless- but in their day these little babies were the gateway to the rest of the world beyond my own neighborhood. They have always held a fascination for me. The first time I saw one was on my father’s dresser with his change. I remember that I didn't need one until I was over 6. I still recall the slogan- "Little enough to ride for free- little enough to ride your knee." 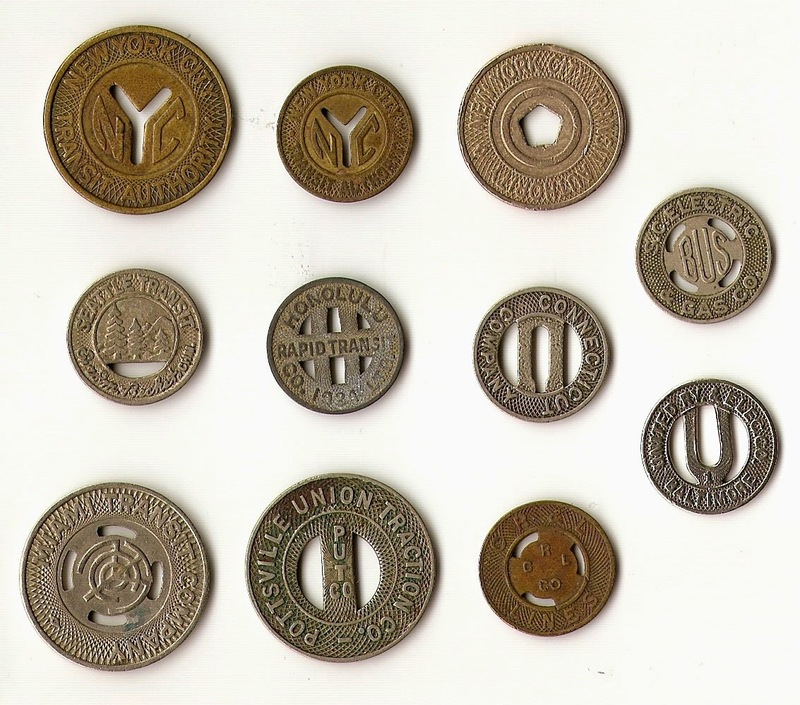 As a coin collector I used to shun these little guys- but I always made sure to save one or two whenever the NYC tokens were changed. I have given them away, one by one, over the years, to friends and my kids. My wife even has one of the older little ones as a necklace. In 1967 I went by "D" train into Manhattan and shopped at Macy's on 34th Street for Christmas using one of these same tokens. The best part of holding one of these in your hands is the unknown, untold story that each could tell. Look at the Honolulu token for instance. I see a sailor on liberty in pre-World War II Hawaii. The trolley probably took him from the docks to the bar district or maybe he even had a girlfriend. Where was this token on the morning of December 7th, 1941? Oh, how I wish these guys could talk! The Miami token recalls a time when people from New York went down to Florida for the winter. While there they used the streetcars and rode alongside the Cuban maids and hotel workers. I have a picture of my mother's family in Miami in the 1940's and can't help wonder if my mom; or even my great granddad Max; used one of these on the way to Neiman Marcus to shop. Maybe even this one!